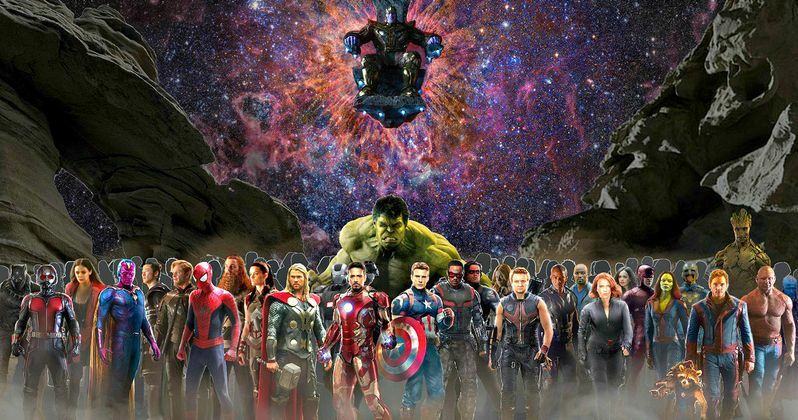 Just how big will Avengers: Infinity War Part I and Avengers: Infinity War - Part II be? Big enough that it's taking two movies to tell the tale! And that means we'll likely see every single living Marvel character introduced in the MCU on the big screen together. At least, that's what co-director Joe Russo is hinting. And this likely includes Guardians of the Galaxy. Many people have been asking ever since Guardians hit in 2014 just how this band of cosmic crime fighters would be introduced to the rest of the Marvel Cinematic Universe characters. While we don't know the hows or whys, it sounds like it will either come in 2018's Avengers: Infinity War Part I or the finale, 2019's Avengers: Infinity War - Part II. Joe Russo doesn't want to come right out and say which characters are in the movie. Instead, he suggests that it will likely include all of them. Director James Gunn has never seemed to interested in his Guardians of the Galaxy characters meeting the Avengers. And he promises that there won't be any sort of crossover in Guardians of the Galaxy Vol. 2. When Joe Russo was asked when Captain America and Iron Man might be introduced to Star-Lord, Gamora and Drax, he had this to say. "That is another one that we would have to reserve as a surprise, but we will say this: People will not be disappointed in the amount of characters in the movie. The concept of Infinity War is that the Marvel universe unites to battle the greatest threat to the world and universe that you've ever seen, and we're going to honor that concept." Joe Russo did open up a little bit about the cosmic nature of Avengers: Infinity War, which finds Thanos trying to collect all of the Infinity gems for his Infinity gauntlet. The previous two Captain America movies, 2014's Captain America: The Winter Soldier and this summer's Captain America: Civil War, are described as being more grounded. The next two Avengers movies will definitely deviate from that path. "I sat in the theater and watched Empire Strikes Back seven times in a row when I was a kid. Yeah, we're science fiction fans as well, Dungeons and Dragons. We collected all the books when we were kids. We had figurines. Anything that you could think of that has to do with fantasy or sci-fi or superheroes was in our universe. We're just going to approach the cosmic side with the same fervor that we did the earthbound work we've been doing. We also are going to work really hard to bring a psychological realism. We obviously can't bring a naturalism to it because it doesn't really exist outside of science fiction, but we can bring that psychological realism to it, to the characters, and that's going to be our focus. Also, it's going to be our focus to explore the cosmic side, applying the same rules that we like to apply to the last two films that we've done. It ends up being the rules of physics always apply or apply as much as we can get them to apply based on what we're doing." What do you think? Are Avengers: Infinity War Part I and Avengers: Infinity War - Part II gearing up to be the two most epic superhero blockbusters of all time? Or is there going to just be too much stuff going on? Let us know what you think in the comments below. Captain America: Civil War is in theaters this May.